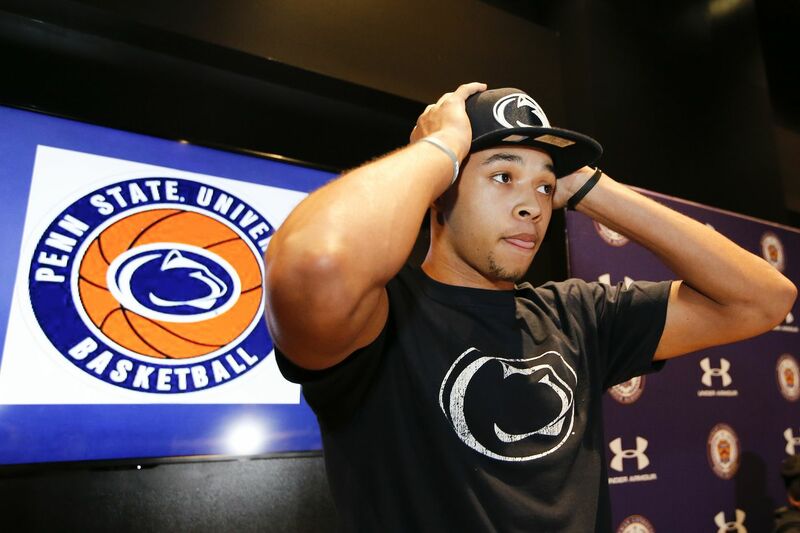 Roman Catholic High School basketball star Seth Lundy shows off his Penn State attire after announcing he will attend Penn State next year. The recruiting interest in Seth Lundy increased significantly for Penn State coaches after they watched him play as a sophomore for Roman Catholic in a Catholic League playoff defeat. Lundy, while battling the flu, produced 20 points and 11 rebounds in a 67-56 semifinal loss to Neumann-Goretti at the Palestra. "I received a few texts from their coaches after that, telling me that they liked what they saw, and they would stay in touch," Lundy said. Lundy hangs on the rim after his dunk against St. Joseph’s Prep in last season’s Catholic League semifinal. That relationship will continue as the versatile and high-leaping small forward announced his commitment to play for the Nittany Lions on Friday afternoon at Roman's Howard Center for the Arts. Lundy is the fifth Roman player in as many years to continue his career in State College. Shep Garner, Nazeer Bostick, Tony Carr, and Lamar Stevens preceded him. Lundy said the Penn State coaches made him feel comfortable. "That didn't have much of an impact on my decision, honestly," the 6-foot-6, 210-pound senior said. "Even if those guys hadn't gone to Penn State, I would still be going there. "I feel it's a place where I can play right away, develop with the help of the coaches, and make an impact every game." Penn State head coach Patrick Chambers is an Episcopal Academy graduate who was an assistant at Villanova under Jay Wright before taking over at Boston University for two seasons. "He's a very good coach, but an even better person," Lundy said. "That's one of the things that stood out about him." Lundy gives a fist pump as the Cahillites wrap up their win over Lincoln in last season’s PIAA Class 6A state final in Hershey. Lundy is a four-star prospect and No. 4 player in the state, according to 247Sports. He chose Penn State over fellow finalists Louisville, Marquette, and Virginia Tech. "I took a close look at the way Penn State uses its players, and I like the way they put their guys in good scoring positions," the 18-year-old said. Lundy (23) dunks over Bishop McDevitt’s DaQuane WIlliams in a Catholic League game last season. Lundy averaged 16.4 points and 8.7 rebounds last season while helping lead Roman to the Catholic League championship and its third PIAA state title in four seasons. "He's competitive, a hard worker, a fantastic leader, and has a college-ready body," Cahillites coach Matt Griffin said. "You could put him in any environment and he'd be successful." Lundy played for Team Final on the Nike EYBL AAU circuit in the spring and summer. "He's tough, competitive, and a physical forward who projects as a wing in college," said Norm Eavenson, of the Middle Atlantic Scouting Service. "He's a very good rebounder, a strong slasher, a better shooter off the catch than the bounce. He will bring lots of energy to Penn State. Former Roman Catholic standout Lamar Stevens (11) is entering his junior season at Penn State. In addition to Stevens, a 6-8 junior, four other area players are current Penn State players: Izaiah Brockington, an Archbishop Ryan graduate, Kyle McCloskey (Germantown Academy), Strath Haven's John Harrar, and Mike Watkins (Phelps School). Lundy's older brother, Xavier, a graduate of Paulsboro (N.J.) High, played at Rider University from 2013 to 2017.